NaturesCoin is the new asset-backed stablecoin economy that creates social capital and environmentally sustainable outcomes. NaturesCoin is a viable new blockchain cryptocurrency that is supported by real-world natural assets and sustainable initiatives. A powerful motivator for corporates to do good in their communities, and an accessible financial option for everyday investors who want to back an environmentally and socially sustainable economy, NaturesCoin is the first of its kind — but, hopefully, not the last. Based on United Nations Sustainable Development goals and accredited by globally recognised certification standards, NaturesCoin expands through certified new initiatives in forestry, water, agriculture and other sustainable programs, through increasing adoption by consumers who want to make a difference, and by corporations whose goal is to advance social responsibility and engage in a new way with customers. We see a world where sustainable values are the currency, not just a byproduct of limited financial donations. Investors in NaturesCoin tokens will gain the utility of access to meaningful projects that are important to them. Shared value will be meaningfully delivered in ways that allow corporations, service delivery agencies, consumers and regulators to track and measure the impact of the value created. The power of NaturesCoin is its ability to be adopted by corporates who can convert their Corporate Social Responsibility initiatives from an expense into a liquid, appreciating Balance Sheet asset that they can report to the market. It allows corporations to deliver real value and engage in a new dialogue with their customers and stakeholders. For everyone, it’s a great way to invest and nominate projects to receive your blockchain-guaranteed support. Throughout history, our systems of money and exchange have been at odds with protecting our natural assets and preserving social unity. NaturesCoin is an idea whose time has come — for us, and for our planet. Developed by a team of philanthropic Australian business people and professionals, NaturesCoin creates a profitable, digital economy that supports positive environmental and social outcomes in the world. Projects that meet standards within the UN Sustainable Development programs can be supported by the NaturesCoin economy — and corporations and communities within the NaturesCoin economy can come together to launch programs of their choice. 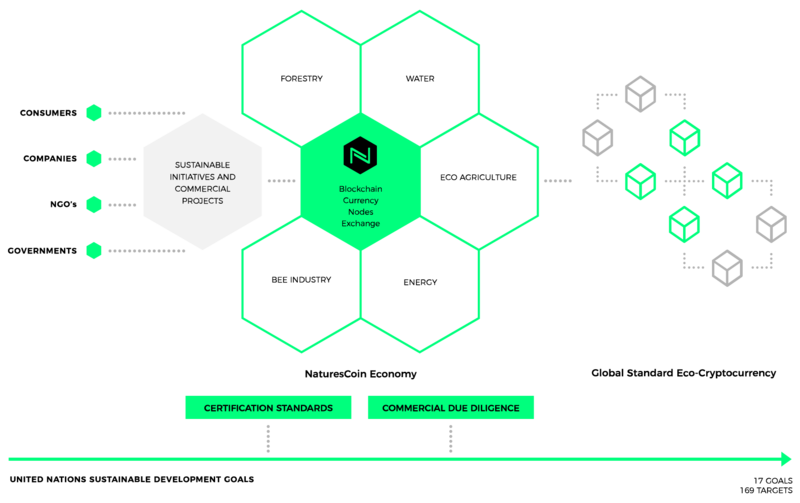 As an asset-backed blockchain economy, NaturesCoin will be home to the newest global initiatives in hemp fibre to replace plastics and other materials; projects to revitalise bee populations and create local industries; vibrant multi-purpose agribusiness, eco-tourism, and sustainable centres in regional areas: and investments in sustainable forestry development. And that’s just the beginning! Of the 17 sustainable development goals set out by the United Nations, 7 relate to our environment — the other 10 relate to social equity, health and justice. NaturesCoin is the currency that will support them all. As with any portfolio of investment, we have to start where we will do the most good. Our initial investments in the eco-agriculture industry (hemp), the bee industry, sustainable ‘estates’ and forestry will expand as people, businesses, Governments and agencies everywhere develop their own projects in the NaturesCoin economy. As an economy where everyone participates, NaturesCoin allows everyone to ‘vote with their wallets’ and attribute their tokens’ value to projects of their choice. NaturesCoin is a new blockchain cryptocurrency backed by real natural assets and sustainable initiatives.